Kenny J: While many eyes have been trained on Jane Foster in Mighty Thor and her battle with the evil Roxxon Corporation, an equal amount may have been wondering what the previous Thunder God has been up to since we were treated to not just a brilliant female God of Thunder but Thors of all shapes and sizes in the Secret Wars crossover. Now Jason Aaron is to explore the downward spiral of the Odinson in Unworthy Thor #1. I’m hoping that this tale reveals the events that led to him losing his trusty weapon, Mjolnir on the surface of the Moon, but even if it doesn’t or that revelation is a long time coming, Aaron has proven that he has a strong hold on the inhabitants of Asgard (and all the Nine Realms for that matter). While Aaron is the steward for all things mystical in the Marvel Universe, it seems Mark Waid is doing the same for the Avengers. The first issue of Champions featuring the fresh-faced namesakes of many classic heroes was a fun, old school approach to team books that will definitely have me returning for Champions #2 out this week. Meanwhile the aforementioned longer-in-the-tooth heroes get a new outing in Avengers #1. The ramifications of Civil War II will play out in this book as the new line-up of Earth’s Mightiest Heroes takes on Kang in the intriguingly titled 'Kang War One'. Andy H: Well, it's been while since Marvel titles dominated my weekly pull-list, but this Wednesday we see a bumper bundle of the little devils. First up is Champions #2. Mark Waid and Humberto Ramos really nailed the first issue; great dialogue, team dynamics and just the right balance between humour and teen angst. Issue #2 promises to build on all this and features a new team member in the shape of the young, time-displaced X-Man, Cyclops. From the look of the cover art, not everybody is thrilled. Avengers #1 is a regrouping of the Avengers team. Thankfully we've lost the 'All New All Different' prefix but luckily we've still got Mark Waid as writer. He's joined by former Elektra artist, Mike Del Mundo. After the departure of the younger Avengers the roster has some new/old faces in the team including the Wasp, Spider-Man and Hercules! More Avengers fun in the shape of Occupy Avengers #1. Essentially a Hawkeye book, this continues Clint Barton's adventures after the events of Civil War II. As if that wasn't enough, there's one more big hitter from Marvel, The Unworthy Thor #1. 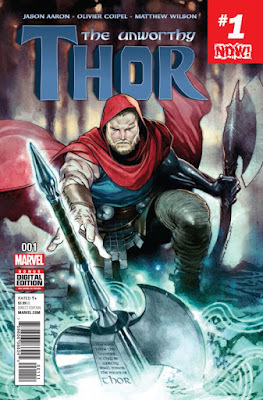 Regular Mighty Thor writer Jason Aaron and artist Olivier Coipel take the Odinson on a journey to reclaim his honour and be worthy of the name Thor. Will they reveal the secret that made Thor unworthy? Admit it, we'd all like to know! Phew, cracking stuff so far and I haven't got to Image yet. It's back! Southern Bastards returns. More from Craw County and Coach Boss but the real draw with this issue is the prospect of more from Roberta Tubb. We've only touched the surface of this character and I'm looking forward to the showdown between her and Coach Boss. That may be some time off but it's going to be fun getting there. Also returning is Nailbiter. Never expected it reach this far but we're up to issue #26 and Joshua Williamson and Mike Henderson have really kept the momentum up. It certainly looks like a great week of reading to look forward to.